1.1 We are committed to safeguarding the privacy of our website visitors and potential / returning customers. 1.4 Our website incorporates privacy controls which affect how we will process your personal data. By using the privacy controls, you can specify whether you would like to opt in / out of cookies and we also provide a consent checkbox on our contact forms giving you the option to allow us permission to hold your personal data for the purpose of booking tours or answering any queries you may have. You can access the privacy controls via the cookie consent banner or via any contact form on our website. 3.3 We may process your personal data that are provided in the course of the use of our services (“service data“). The service data may include Your personal details that you provide us with to enable us to book appointments or for any other services you request from us. The service data may be processed for the purposes of operating our website, providing our services, ensuring the security of our website and services, maintaining back-ups of our databases and communicating with you. The legal basis for this processing is consent OR our legitimate interests, namely the proper administration of our website and business OR the performance of a contract between you and us and/or taking steps, at your request, to enter into such a contract. 3.5 We may process information relating to our customer relationships, including customer contact information (“customer relationship data“). [ The customer relationship data may include your name, your contact details, and information contained in communications between us and you. The source of the customer relationship data is you. The customer relationship data may be processed for the purposes of managing our relationships with customers, communicating with customers, keeping records of those communications and promoting our products and services to customers. The legal basis for this processing is consent OR our legitimate interests, namely the proper management of our customer relationships. 4.2 We may disclose specify personal data about you (ie Name, Address, Contact Number) to our suppliers or subcontractors insofar as reasonably necessary for the purpose of helping to solve, acquire the necessary parts for, the PC / IT problem you have. (a) Personal data will be retained for a minimum period of 12 months following point of contact from the client to Paphos PC Repair, and for a maximum period of 12 months following work carried out by the us. (a) the period of retention of personal data will be determined based on any legal, insurance related or complaint related issues and any timescale that may adopt. 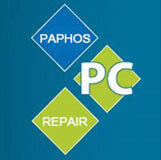 13.1 This website is owned and operated by Paphos PC Repair, Coral Bay, Paphos.